Nsabimana Aloys, Water Project Manager withEmily Haas, Church Partnership Coordinator share how Rwanda's Water Team celebrated World Water Day this year. Thanks to 20Liters, Mars Hill and our other partners who help make all this possible. World Relief hosted their annual Walk for Water in Masaka Sector, Rwanda. Around 10 am, the gathering of 200 staff, local leaders, pastors and community members began at the church site. After hiking for about 40 minutes down to the swamp, they gathered water then hiked back up to the celebration site, singing and dancing as they went. 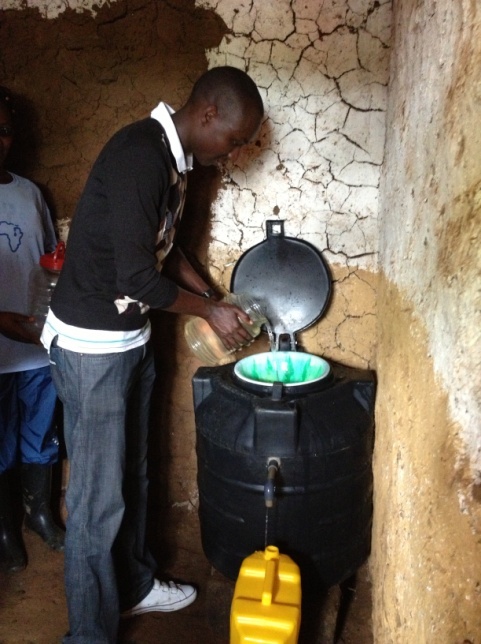 On the way back,they stopped at one home to demonstrate the water filtering of the freshly fetched water. Some commented that the water we gathered in the swamp looked clear and clean, but it is still not drinkable. Because it is stagnant water, it is even worse than the Nyabarongo River. The family at the home gave news about how before they received the filter, they had much sickness in the home but now their members are healthy and are not falling sick due to unclean water. For the rest of the celebration, staff distributed 100 jerry cans and 10 filters to participants, Water Project volunteers performed a skit to demonstrate the importance of clean water and how to manage filters, many gave testimonies about life before and after the filters, and leaders gave speeches about the importance of clean water. In the various speeches, many gave thanks to all who contributed in this project. One local leader shared the important role his filter had played in his family. Before he received a filter, his children were sick every day as they used unfiltered rain and river water. Now, his family was no longer falling sick. He asked the blessing of the Lord on World Relief and all who were involved in bringing clean water. Two beneficiaries shared their testimonies about how they would drink water directly from the river or swamp without stopping to boil it first. Now that they have filters, they use this clean water for everything, drinking, cooking, washing, food preparation, and in preparing drinks like juice and tea. They are grateful to World Relief, Mars Hill, 20 Liters, and the Water Project volunteers. It was a great time of celebration and all participants were happy for what God has done in these communities through World Relief, 20 Liters, and Mars Hill.